Looking for a USED 2000? Ellis Mfg. Company, Inc. is a family owned small business located in the city of Verona in south central Wisconsin, just five miles from Madison, the state capital. The year 2000 marks 50 years of manufacturing in Verona for Ellis. In 1950, however, the product line for Ellis was quite different. The company was then called D.R. Ellis Manufacturing and they produced transplanters, a farm implement used for transplanting plants such as tobacco, cabbage, peppers, strawberries and nursery stock. Ellis Transplanters are still in use throughout the country but manufacturing of this product was discontinued in the early 1980’s. Parts for these machines are still available. 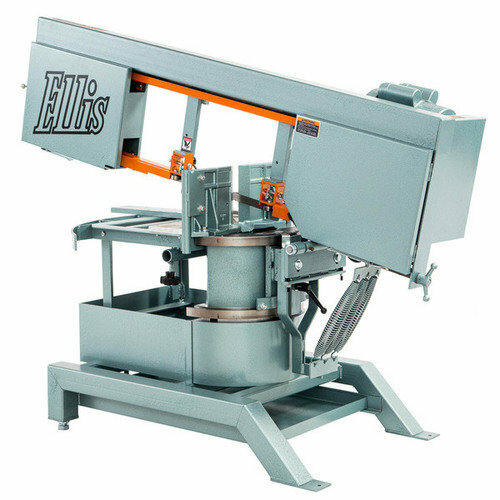 The present line of equipment was first manufactured in the early 1970’s with the introduction of the Ellis Mitering Band Saw and was sold by Ellis Machine Tool Co. In 1982, D.R. Ellis and Ellis Machine combined to form Ellis Mfg. Company, Inc. Today, the company manufactures eight models of mitering band saws, plus a belt grinder, numerous drill press models and welds band saw blades for hundreds of different band saw machines. Today, after various expansions to the original buildings, Ellis Mfg. Company sits on nearly 3 acres along the Military Ridge Bike Trail in Verona, Wl, known as Hometown U.S.A. Customers are located in all 50 states, Canada, Europe and Asia. 13 ModelsView more about Ellis Mfg. Company, Inc. Looking to Purchase a New ELLIS 2000?